Although today is the last day of the month, let’s remember that hiring people with disabilities, including disabled veterans, must be a year-long focus. 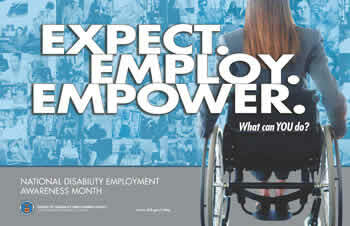 People with disabilities have traditionally been underrepresented in our nation’s workforce. Efforts like October’s focus on employing people with disabilities highlight the business case for making the workplace as inclusive as possible. In other words, hiring people with disabilities makes sense and companies should make special efforts to recruit and accommodate these employees. To help veterans with disabilities as they seek to return to employment, VetsFirst developed the online guide, “Disabled Veterans Employment and Education: Gearing up for Your Future.” This guide provides essential resources to disabled veterans who are searching for employment or considering additional education. This online guide encourages veterans with disabilities to begin to seek out answers, ask more questions, and make informed decisions that will ultimately lead to success in the workplace. Returning to work following a disability is a critical aspect of returning to life. We hope that a continual focus on increasing employment opportunities for people with disabilities will lead to new opportunities for all.